One of the injuries Cincinnati is dealing with right now is their starting QB, Andy Dalton. While this puts the Bengals at some obvious disadvantages, Lynn had some caution about defending against Dalton’s back up, Jeff Driskel. “He can do all of those things, the zone-read, run-pass option. I’m sure they’ll do more of that this week with him, but he also has a big arm. He can throw the ball around pretty well, too. He has two good receivers in [Tyler] Boyd and [John] Ross. Running back Melvin Gordon III has been injured, but it looks like he might play. Lynn said he was running around the practice facility on Wednesday, so his progress looks good. The one way Lynn will know Gordon is ready to will be how well Gordon can change direction. Austin Ekeler will get the start if Gordon is unable to play. Plus they have Justin Jackson who has been showing some flash. Quarterback Philip Rivers spoke with the media as well. 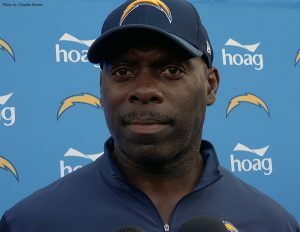 Like the head coach, Rivers had no comment on offensive coordinator Ken Whisenhunt, who is being considered for the head coaching job at Georgia Tech. Like his coach, Rivers stayed focused on the next game. Rivers is pretty happy with his two primary targets, Keenan Allen and Mike Williams. He hopes this Chargers offense can keep the Bengals defense off balance. Both Williams and Allen have scored touchdowns this season, which is just one of the many reasons the Chargers are challenging the Kansas City Chiefs in the AFC West. On an even brighter note: The Chargers just announced defensive tack Corey Liuget is the Chargers nominee for the NFL Walter Payton, Man of the Year Award. From the beginning of his career Liuget has had commitment to outstanding service to his community — “from participating in Play60 youth football camps, visiting kids in hospitals, speaking to high school students and kids in juvenile halls, taking kids shopping for holiday gifts at his annual Shop with a Charger event to working alongside law enforcement to raise funds for inner city youth sports programs.” — he is a great example for his teammates, the league and his fellow citizens. Game time on Sunday will be 1:05 p.m.